Does Bluetooth Have a Future in Pro Audio? As long as there have been recording studios, there have been lengths of cable. One might assume that the two are virtually inseparable, audio signals have to travel through something after all. What other alternatives are there? What if I mentioned the word Bluetooth? You may roll your eyes thinking about dodgy little speakers and latency issues… surely they don’t have a place in the world of pro audio? What you may not know is that Bluetooth has now reached version 5.0, bringing greater potential to a technology that many still view as limited. Although this upgrade probably won’t see professional studios ripping up their cables just yet, wireless pro audio could very well be a real thing in the not so distant future. 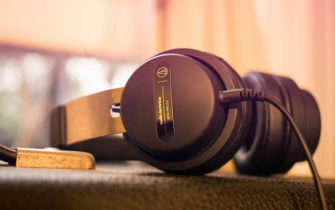 As even studio standards such as Audio-Technica’s M50x headphones are receiving the Bluetooth treatment, we’re taking take a look at wireless technology, how far it’s come, and the developments that could point to a future without cables. Although Bluetooth 5.0 probably won’t see professional studios ripping up their cables just yet, wireless pro audio could very well be a thing in the not so distant future. Bluetooth technology isn’t new. The idea has been around since 1989, when Nils Rydbeck, CTO of Ericsson Mobile went about developing a ‘short-link’ radio technology to support wireless headsets for mobiles. The tech as we know it was invented in 1994 by an electrical engineer called Dr. Jaap Haartsen, who named his invention after the 10th-century Danish king Harald Bluetooth, known for uniting his people and also his particular fancy for blueberries. The standardised version of Bluetooth 1.0 rolled out in 1999, with the first phones adapted to the technology hitting the market the year after. In the early days, Bluetooth was mostly limited to flagship smartphones, which let users talk through wireless headsets. Most will probably remember the hilariously novel sight of people having a loud conversation on the street without a phone. Before long the technology found its into more practical uses such as speakers, printers, laptops and vehicle hands-free sets. It particularly exploded between 2004 and 2006, when gross weekly shipments of Bluetooth products jumped from three to ten million. The new toy that most thought was destined to be a fad looked like it was here to stay. 2004 marked Bluetooth version 2.o as well as the first set of stereo Bluetooth headphones, but at the time the technology was clunky and expensive and they didn’t exactly take off until the 2010s. It goes without saying that there were a few issues with Bluetooth audio, especially in the early years. There are a few main reasons why things have historically gone wrong with Bluetooth, including proximity, compatibility issues and interference from devices that bleed into Bluetooth’s 2.4ghz spectrum. On the audio front, however, there lies another set of considerations. The first Bluetooth headphones were limited by low transmission rates and primitive audio codecs, primarily SBC, meaning that only sound compressed to the equivalent of 192kb/s could be heard, resulting in a relatively tinny, low-quality sound. Another limitation faced by those wanting to use Bluetooth headphones or monitors for production purposes was the issue of latency. Compared to wires, having Bluetooth in the equation adds an extra step between the audio source and your ear. The device has to decode the signal before playback, adding delay. It’s frustrating, but does this mean that Bluetooth will never find a way into professional monitors or monitoring headphones? I wouldn’t be so sure. Technology advances fast. Every year processing power is becoming more and more efficient and even though Bluetooth may have had slow beginnings, its subsequent versions have offered more speed and reliability than the last. In the step from Bluetooth version 1.2 to 2.o, transmission speeds almost tripled from 721kb/s to 2.1Mb/s. Incredibly, in the next leap up to version 3.0, speeds of 24Mbit/s were achieved. Between 3.0 and 4.0 transmission speeds remained, but transmittable range jumped six-fold from 10 metres to 60 metres. Version 5.0 now offers speeds of over 50Mbit/s and distances of 240 metres, giving it more reliability than ever before for data transfer and audio playback. Despite upgrades in Bluetooth technology, improvements to latency and audio quality still depend on both compression format and hardware of the audio product. Only a few years ago, Bluetooth audio equipment was mainly restricted to lifestyle products; speakers you could take on a picnic or headphones more suited to playing songs from your iTunes than any kind of serious production task. But Bluetooth’s specifications have come a long way, and audio brands have been looking to find ways to implement wireless technology into pro audio gear. A big factor in the improvement of audio transmission has been the introduction of new audio codecs such as aptX and aptxHD, which have allowed better quality audio transfer with latency approaching 0.1 seconds. This has allowed manufacturers to explore wireless monitoring technologies, for example. Companies such as Audio-Technica have been able to revamp popular studio headphones such as the M50xBTs with new Bluetooth capabilities, making use of version 5.0’s higher transfer rates and compatibility with the latest codecs, meaning barely detectable latency times and audio quality comparable to their wired counterparts. Can We Expect a Completely Wireless Future? When you look at the steady progression in Bluetooth technology, there’s no questioning that things are moving in the right direction. There may still be room for improvements, and I wouldn’t expect professional studios to be wire free for some time yet. However, subsequent versions of Bluetooth and new audio codecs are begging to pave the way for a wireless future in the pro audio world and eventually there will come a time when people look back on messy twines of cable as a clumsy and archaic solution from the past. Find out more about Audio-Technica’s M50xBT headphones here.